As the art gains in maturity and popularity more and more tai chi practitioners are able to learn and investigate the benefits of training and practising all aspects: hand and weapon forms together with all aspects of partner work including martial applications. Often there is a perception, that fighting applications is violent and not the domain of those who may have accessed the art for qualities such as relaxation and stress-reduction. However without having a knowledge of the purpose of the various movements and postures in the Hand or Weapon Forms there could well be a lesser understanding of the fuller aspects of the arts. Learning applications can yield many benefits including: increased confidence, better body awareness, improved reflexes and ultimately developing the ability to remain relaxed and centred in times of conflict. 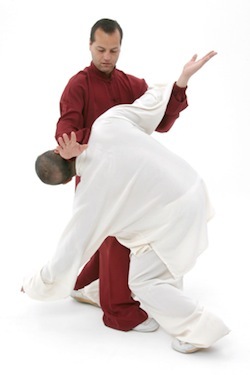 Tai Chi Martial Applications is not about attacking others but more concerned with reacting effectively when threats are presented, being physical, psychological or emotional. Through training these aspects you will learn to understand the inter-change of Yin/Yang in a practical sense whilst maintaining and strong, connected centre and fluid, effective movements. Over the course of these pages we will try to represent all styles and approaches to the work of martial applications through articles, images and videos; contributions are also welcome. below is a short film showcasing a range to tai chi martial applications.